Re-order items and groups, change group names and create new ones, and change quantities and prices with ease. If you raised an invoice from an opportunity or project, your invoice items are organized based on the grouping options you selected. Grab the handle (the three bars) to the left of an item or group to move items around the list. Use the add a new group link at the bottom-left of the items list to add a new group to the opportunity. Sometimes it's good to add a few words to provide a bit more detail about a product, service, or group. To add a description, click the blue menu at the end of a line in the opportunity items list and choose Edit from the menu. 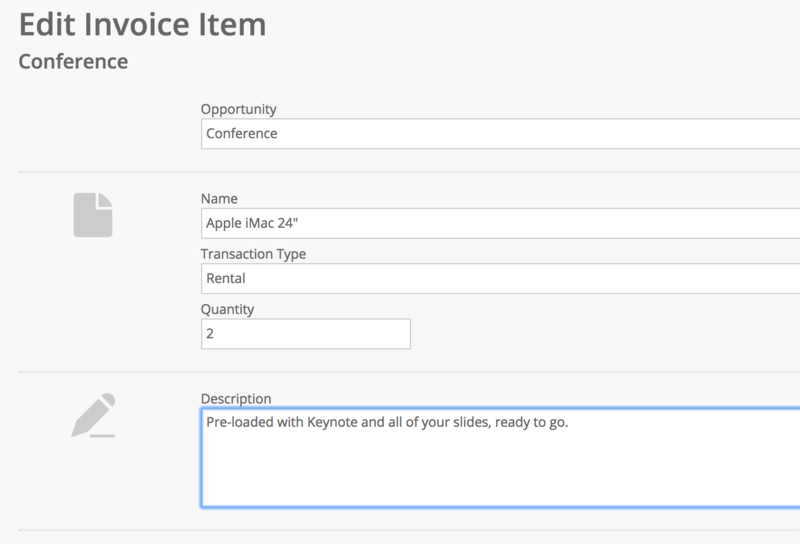 Add a description to the description field. Descriptions appear in the items list underneath the item. Adjust the name, chargeable days, quantity, price, and discount for your items by clicking the blue arrow to the right and choosing Edit from the menu. Use the fields on the edit invoice item screen to make changes. Accessories are set up against products in Resources > Products, but you can add “one off” accessories to items on your invoice. This will not be configured in Resources against your product, it will only persist for this invoice. To add an ad-hoc accessory, click the blue arrow to the right of a line and choose add item from the menu. Items added will be nested underneath the item. Sometimes you might need to add additional items to your invoice that weren’t on the opportunity or project. Use the add a new invoice item link at the bottom-right of the items list to do this. Fill out the fields on the add invoice item screen to add a new item. Choose text item to add a line that’s not in your inventory. ⚠️ Keep in mind that invoices do not impact availability, so rental and sale products aren’t taken from stock. Changes you make to the items list are reflected on the document layouts generated by your system. Current comes with a variety of layouts to choose from, including two invoice layouts. Each of the layouts displays information slightly differently, meaning that you can create something that’s really bespoke. Don’t forget that all of the document layouts generated by Current RMS are fully customizable. The invoice has been posted to a linked accounts solution. Once posted, the invoice is locked in Current RMS to maintain data integrity between the two systems. Your account doesn’t have permission to make changes. Your account administrator might have set up a role on your Current RMS account to prevent your account from making changes.